11.27.2013, Books, by Jack W Perry. 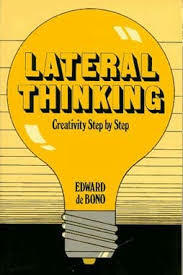 Edward deBono coined the phrase “lateral thinking” in 1967 and wrote the book, LATERAL THINKING (Harper & Row, US) in 1970. Basically it is about a way to reason and look at situations from different points of view. I am sure there are many complex facets to this. But I generally find a single piece of it and apply my own perspective. I have referenced and read bits of the book for years. I like the way it focuses me and helps exercise my brain. 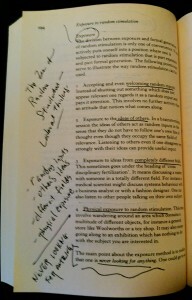 My understanding and spin on these two pages (this is a review of only two pages of a book). Random Inputs (RI) – must be accepting to everything. Who knows where the next inspiration comes from? Don’t miss the opportunity by being closed minded. Keep an open mind. Other’s Ideas (OI) – even those diametrically against. Many times the best solutions come from a hybrid of two opposites. Different Fields (DF) – everything is related. The task is to discover and understand the relationships. Once that happens, new solutions can be applied to old and new problems. Physical Exposure (PE) – get out of the house. See and small and touch different things. Browse. Anywhere, anytime. Then once any/all of the above are done, just observe and let things happen. Don’t try to force the issue too much. Let go of controlling that time and open your mind. I generally have the issue or problem in the back of my mind. So that I am aware of what might be helpful. 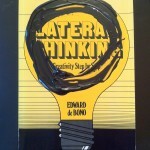 But it is a struggle to try to maintain a blank mind. But it helps. Many paths can lead to the same solution. It is important to move forward. When blocked, it is necessary to re-view the pressure, and come up with a new path. The results will be achieved and creative solutions will be learned along the way.